The Inno Spot LED from ADJ crashes through a new barrier of brightness and breathtaking excitement in DJ/club lighting effects. Powered by a mighty, groundbreaking 50-watt LED source, this compact intelligent moving head blasts stunningly brilliant gobo/colour effects on walls, ceilings and dance floors for a truly spectacular lightshow at any nightclub or venue. Along with its 50 watts of LED muscle, the Inno Spot LED is loaded with exciting features that add to its wow-factor. You can dazzle the crowds with its high-energy built-in lightshow programs, which kick in automatically when the unit is used in Sound-Active or Master-Slave modes. 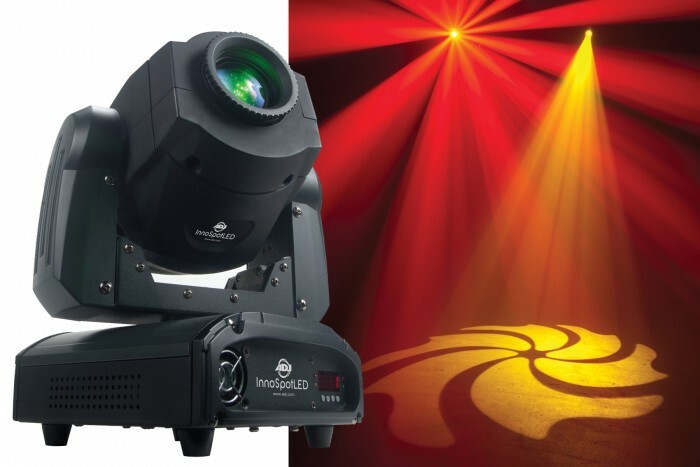 The Inno Spot LED can also be operated with a DMX-512 controller (10 DMX channels) to unleash any of its abundant features, which include: 6 rotating, replaceable gobos; 8 colours + white; Gobo Scroll mode; Gobo Shake effect; 3-facet prism; pulse and variable speed strobe effect; and 0-100% dimming. A manual focus and separate colour and gobo wheels add to the versatility of the Inno Spot LED. With a 17° beam angle and 540° pan/270° tilt, this brawny moving head will fill an entire room with its eye-popping visual display. "ADJ continues to push the boundaries of LED technology with the massive 50-watt LED source used in the Inno Spot LED," said Alfred Gonzales, national sales manager for ADJ. "This extremely high-output white LED source produces a hard-edge beam similar to that of a traditional halogen or discharge lighting effect. This beam is so powerful, it truly sets new standards of brightness for LED moving heads." Despite the strength of its hard-edge beam, the Inno Spot LED uses a fraction of the energy of comparable-output halogen or discharge moving heads – drawing just 93 watts. It has lower maintenance requirements too, since its LED source is rated at 50,000 hours, virtually eliminating the hassle of changing lightbulbs. The Inno Spot LED is also very lightweight and small in size, especially for its high output. Ideal for mobile use, it weighs just 15 lbs./ 6.5 kg., which makes it easy to transport and set up by entertainers of any size. Measuring a compact 9.75"L x 8.25"W x 11.25"H (242 x 205.8 x 284.6mm), it won’t take up a lot of space in vehicles either. Extremely user friendly, the Inno Spot LED features a convenient four-button menu system on the rear panel that allows for simple navigation through its settings. In addition to manual and DMX operation, the unit is compatible with the optional ADJ UC3 Series controllers (sold separately) for easy remote control of its basic functions. Other quality features on the Inno Spot LED include: Auto X-Y repositioning, stepper motors with microstepping for smooth, accurate movements; and a fan cooling system. Extremely cool running, the unit can stay on all night with no duty cycles. The Inno Spot LED includes switchable voltage: 120V-230V, 50/60 Hz.